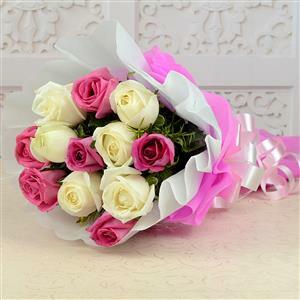 Send Pretty Pink Roses Bunch to Chennai. Gifts to Chennai. Send Flowers to Chennai. Description : This is a beautiful flower arrangement created by Gift2Chennai.com. If you want to enthrall your loved ones with fresh and pretty flower then this would be ideal to send to Chennai.The arrangement consists of 6 White & 6 Pink Roses Bunch tied with white & Pink Cloth making it look attractive. When you select Gifts to Chennai do not forget to add this and delight your dear one.